Dominoes is a fun and popular table game that can be played between two or more players. The game uses special tiles (called “dominoes”) that have circular dots (known as “pips” or “spots”) displayed on their faces. The simplest form of the game is called “block dominoes,” which has spawned several variations over time. Whether you’re brand-new to this exciting pastime or you simply haven’t played in a while and need a refresher, here are the basics you need to know to get started. For the sake of simplicity, we’ll first set you up with playing a game of two-player block dominoes. Unless you’re playing an online version, the first thing you’ll need to do is get is a set of dominoes; each set typically includes 28 rectangular tiles marked with anywhere from zero to six dots on each end. 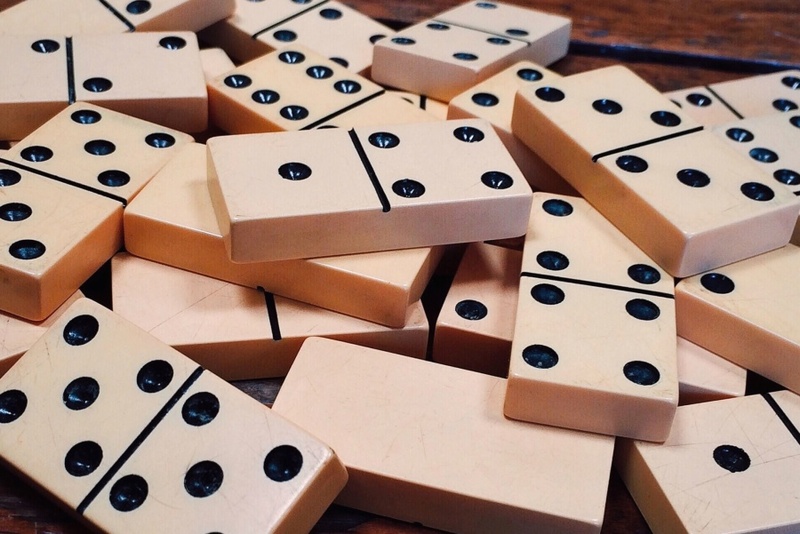 Fortunately, domino sets are typically inexpensive and can be readily acquired at a thrift shop, convenience store, yard sale, or online store. Obviously, rather than buying your own set, you can always borrow one from a friend or relative. To prepare for play, you must first pick a flat surface that has a reasonable amount of space. Popular choices are kitchen, living room, library, or cafeteria tables. But, in any case, make sure that your environment allows for a bit of noise, since games can sometimes get quite spirited and competitive. Also, the dominoes themselves will clack when they’re placed on the table. First, you and your opponent must agree on the number of total points that will determine the ultimate winner (it’s usually 100 or 200). Next, will each draw seven dominoes from the boneyard, making sure that neither of you can see the other’s tile faces. Then, you must figure out who will play first. Obviously, there are several ways to do this, including flipping a coin. A common practice is for each player to pick one extra tile from the boneyard, and the player who draws the tile with the most pips gets to go first. In the event of a tie, simply draw additional tiles until a winner is determined. Just make sure to mix these extra tiles into the boneyard (face down) before play begins. Traditionally, the first player will lay down a double tile in the center of the playing area as his or her first move, although this is not a hard-and-fast rule. Note that the first domino does not need to be positioned in any particular way, whether vertically or horizontally. The second player must then attach one of his or her seven tiles to either end of the first domino, provided that the conjoined ends of the first two tiles have the same number of spots. For example, if the first domino played is double-sixes (i.e., it has six pips on each end), then the second player can only attach a domino that also has a six on (at least) one side. Place the dominoes together end-on-end while matching identical numbers of spots. Note that once one end of a domino is attached to another, the adjoined end is now considered “closed,” and neither player can attach additional dominoes to that node. As such, for the duration of the game, there should never be more than two open ends anywhere on the table. If find yourself unable to play your turn because you don’t have any matching dominoes in your hand, then you must pass your turn. Also, if you are running out of space on the table, you’re allowed to place the next domino on whichever side of the open tile will turn it in the most useful direction. The first person to get rid of all seven of his or her dominoes in any given round is named the winner. The victor is then awarded points based on the aggregate number of spots left on their opponent’s remaining tiles. If the players cannot finish a round due to a stalemate, then they simply show each other what tiles they have left and compare the total number of pips they have left. The person with the fewest total spots is the winner of that round, and he or she will receive a number of points equal to the difference between his or her total pips and their opponent’s. If there is a tie, then the person holding the tile with the smallest total number of dots is declared the winner. The players continue round after round until one player reaches the set number of points you agreed upon at the beginning of the game. They say that variety is the spice of life! For example, throughout the gaming world, blackjack players dabble in variants such as “Blackjack Switch” or “Super Fun 21” (the latter of which allows players to split a hand up to four times, and if they have six cards totaling 20, they automatically win!). Texas Hold’em fans can spice things up by playing modified versions like “Unfold Poker,” which includes an additional side pot that the players who fold pre-flop can compete for. Similarly, dominoes players engage in several variations of block dominoes—including “draw dominoes” (also known as the “draw game”). In certain parts of the world, the “draw game” is even more popular than block dominoes. 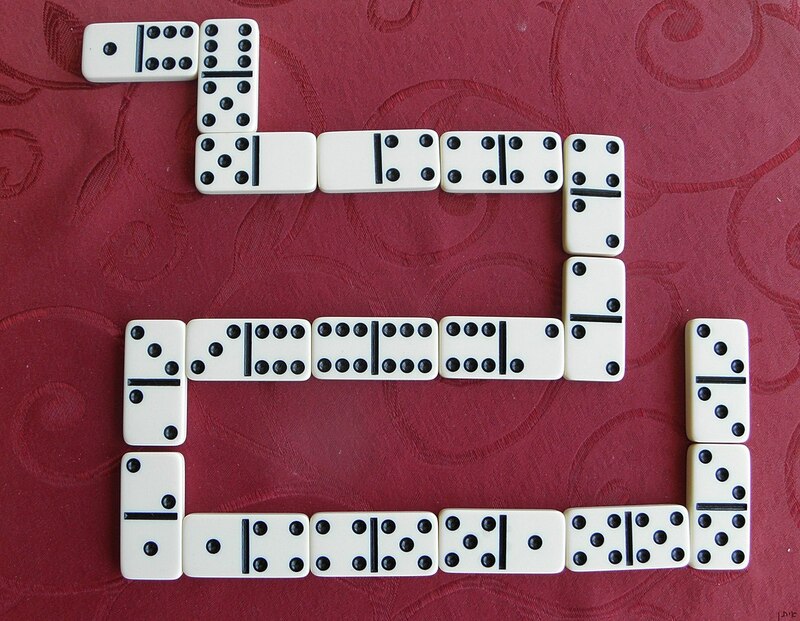 Players take fewer dominoes at the beginning of the game (two players would start with 7 tiles, three players with 5 tiles, four players with 4 tiles and five players with 3 tiles). But when a player is stuck without a tile to play, they can take a domino from the boneyard. When the sleeping dominoes run out, players who cannot make a play simply skip their turn (as they would in block dominoes).